Imagine your life is a bucket and time is a drop of water. Perhaps, at one time or another in your life you have felt that there were no answers, no choices, no hope and no point in trying any longer. But there was still a tomorrow. Drop by drop. Suppose you found you were at a crossroads with detour signs, one way streets and construction seemingly blocking every possible way to proceed. Suddenly you may have become aware that there were no friends, family, counselors, clergy, or available options for you to seek solace, find comfort or peace from turmoil. We often hustle into each day with our hopes, dreams, goals, tasks, responsibilities and clocks trying to accomplish something, even if it is to just reach the end of it. But there is still a tomorrow. Drop by drop. Imagine now, there is no tomorrow. Your bucket is rapidly approaching its limit. How would this change your thoughts? What would be most important for you to achieve? Who would you want to share these last hours minutes or seconds with? It is difficult for me to comprehend there would be no tomorrow. I have Pasta sauce thawing in the refrigerator, there are chapters to read in my class, there is potato salad I want to take to a Birthday party. But then these are the thoughts from a person with a relatively pain free, mostly healthy body, growing spirit of hope, and compassion. A mind eager for continued learning, creativity and consciousness. Life has shown me many paths. Along this journey I have seen many different people. Each who cope in their own way. Each person has the same number of hours in every day. Yet I see many with vastly different focus, priority, and ambition. They are rightly giving their attention, energy and purpose to a countless array of topics, goals and directions. Among these there is constant debate in the world of who is most wise, wealthy, famous, or attractive. We want to know who is the most talented, strongest, or fastest of all. Billions of dollars are spent to direct our attention, shift our focus, and recruit our interest. We are consumers after all. Every one of us, from the moment of birth, targeted for advertisement. What we consume most of all is time, every one of us at the same pace every day. Drop by drop. What we often waste most of all is time also. And we often do not put enough value on our time until there is no tomorrow. Caring Choices hopes that by encouraging conversation between people we can eliminate the barrenness of lost hope when our lives are suddenly faced with the reality that there may be no tomorrow. Long before it becomes hours, minutes, or seconds left, there is opportunity for discussion about choices, hopes, and questions asked that may or may not have answers. But the questions will still then be asked. Questions asked by and with family, friends, counselors or clergy. Questions can be asked about options, hopes, dreams, goals, tasks or responsibilities. Is your bucket of time half full, or is it half empty? Please don’t wait until “The last drop in the bucket” and opportunity is lost. 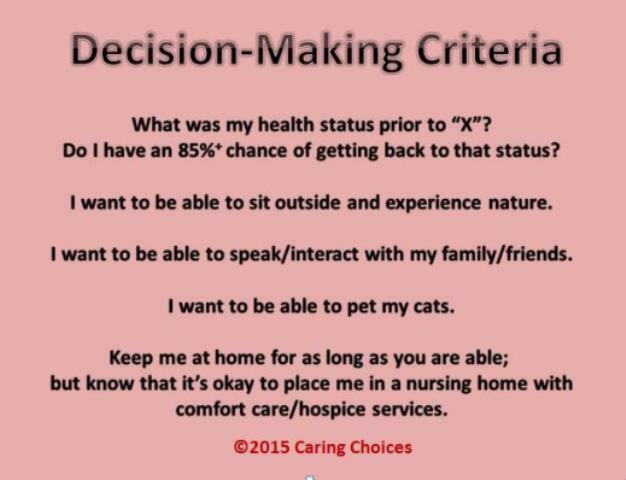 This entry was posted in Advance Care Planning, Personal Stories on July 11, 2015 by James Desiderati.